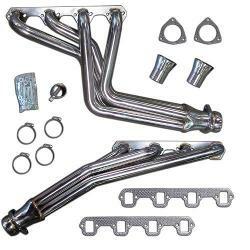 Our NEW STAINLESS STEEL Long Tube Headers are designed specifically for the 66-77 Classic Ford Bronco. Our long tube headers provide more power and better sound than shorty headers. 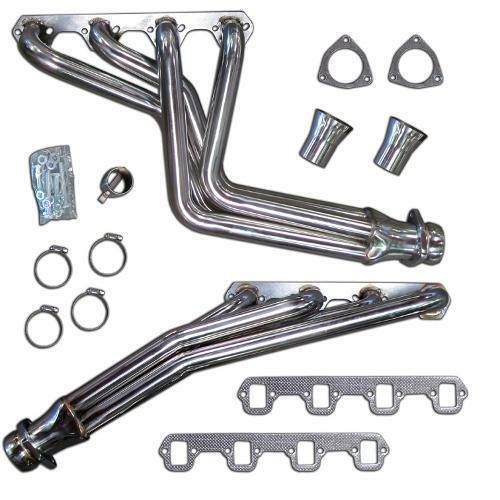 These headers were designed for the Early Bronco and therefore provide excellent clearance. It is even possible to remove & replace the starter without removing our headers. These headers will work with factory straight end spark plug boots, but we prefer to use 135� boots with these headers for better clearance. NOTE: HEADERS SHOULD NOT BE USED FOR NEW ENGINE BREAK-IN!!! While these headers are designed to eliminate as many clearance issues as possible, if you have a manual transmission, you will need to bend the clutch bell crank rod for clearance. For fuel-injected 5.0 engines, these headers will work with GT40 heads. They will NOT work with GT40P heads. Use of aftermarket heads may potentially cause clearance issues. SECONDARY NOTE: Some 351W Bronco's with manual transmission might require slight bending of the clutch bell crank for proper clearance. DOES NOT FIT 351 CLEVELANDS! When aluminum heads are used, we commonly run into clearance issues with the frame rails. IF THESE HEADERS ARE MODIFIED IN ANY SHAPE OR FORM (GRINDING, CUTTING, COATING, ETC.) THEY WILL BE DEEMED UN-RETURNABLE! AS ALWAYS, WE HIGHLY RECOMMEND TEST FITTING BEFORE DOING ANY OF THESE MODIFICATIONS. WILL REQUIRE MODIFICATION IF USING AN AUTOMATIC OVERDRIVE TRANSMISSION. Will require bending and grinding. Also note, due to the extreme heat that goes through the exhaust, the finish on these headers will likely SLIGHTLY discolor after the first few initial uses. Nice looking headers, fit nicely. Was surprised that the collectors are for 2" pipe which seems small for my 351W. I installed these last night and these were by far the easiest headers I've ever installed! They are so well fitted and of such high quality, I am very pleased. Installed these headers on a 1974 Bronco with a 351w and manual 3 sp. Since the engine was out we installed the to the engine and then the lowered the engine into the body, made our job easy but could have installed after the engine stall without hassle. The flange bolt holes are spot on, good gaskets came with the headers, bolt were Heddmen so they were quality and everything is polished to a bright finish. The ball flange reducers size down the flange from 2 1/2 inches to 2 inches so it was easy to just cut the reducer back to it would fit a 2 1/2 " exhaust. Got to give Tom a thumbs up on these headers. Quality, fit and finish are all top notch and for the cheapest price on the market. Quality on these looks great. Installation is drop in on passenger side. Drivers side had to remove brake booster, valve cover, and clutch linkage to make enough room to get it in there. But no modifications needed once in place. Would've gone 5 star, but 2" collector reducer seems a bit small for these. Wish it stayed 2.5"